A 30-year-old man arrested over the death of a baby who died after being bitten by a dog has been released on bail. Police have now officially named the three-week-old as Reggie Young. The scene outside the home in Falkland Road, Ford Estate, in which three-week-old Reggie Young was bitten by a dog. Reggie died in hospital after the attack by a terrier dog at his family’s home in Falkland Road, Ford Estate, in the early hours of yesterday. A police car is still stationed outside the family home today, while tributes of flowers, cards and toys line the fence outside. 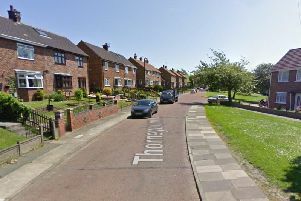 A statement released by Northumbria Police today also officially named the tragic baby as Reggie Young read: “This is an update in relation to the death of a baby boy in Sunderland. “Police are now in a position to release the name of the baby who died as Reggie Young. “Officers are continuing to offer support to Reggie’s family and will continue to do so. “Extra patrols will remain in the area to offer reassurance to the local community and answer any concerns residents may have. Police have emphasised it poses no threat to the public after neighbours spoke of their horror after finding out about the tragedy.